Google, the leader in search engine is very popular for their techniques in search page innovations. Last month, "doodle" for the London 2012 Olympics became popular and climbs to top search results for the curious netizens. 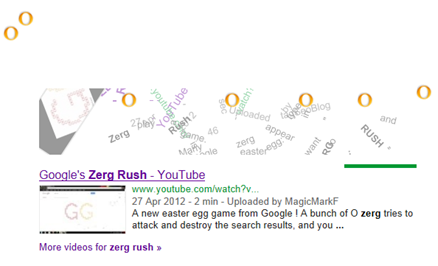 Lately, another strong campaign of Google hits web search, it's the "zerg rush". Zerg Rush is among the top rising term in Google analytics for the last seven (7) days. A search query on Google for the words "zerg rush" will lead you into battle with small “o” that destroy search results if they are not clicked with the mouse pointer. Although it was introduced by Google during Easter Sunday this year, zerg is still a hit to Filipinos. Your only weapon is your trusty mouse (or your trusty finger if you're using a touch screen). Clicking or tapping on the attacking Os will eliminate them one by one. Google will keep track of your hit count, showing you how many Os you've defeated and your average rate per minute. From knowyourmeme.com, Zerg Rush is an online gaming term used to describe an overwhelming scale of attack carried out by one player against another in real time strategy (RTS) games. The term originates from the popular RTS game Starcraft, in which the “Zerg” race is notoriously known for its ability to mass-produce offensive units within a short time frame, thus allowing the player to overpower the opponent by sheer number.